Winter means getting out your scarf and a cozy hat to brave the cold — if you’re located in the Northern hemisphere that is. For all those occasions when your projects may need to get dressed up a little, we are happy to present to you the free Clothing Icon Set created by the design team at Creativebin today. The set includes 40 icons with everything ranging from shirts, pants and dresses to a blazer, hat and even a scarf. Available in nine styles and four formats (AI, EPS, SVG and PNG). Please note that this icon set is licensed under a Creative Commons Attribution 3.0 Unported. You may modify the size, color or shape of the icons. No attribution is required, however, reselling of bundles or individual pictograms is not cool. Please provide credits to the creators and link to the article in which this freebie was released if you would like to spread the word in blog posts or anywhere else. Please note that this icon set is licensed under a Creative Commons Attribution 3.0 Unported. You may modify the size, color or shape of the icons. No attribution is required, however, reselling of bundles or individual pictograms is not cool. Please provide credits to the creators and link to the article in which this freebie was released if you would like to spread the word in blog posts or anywhere else. Today’s icons are presented in nine different styles: Stroke, Fill, Black, Color, Color-Stroke, Color-Shadow, Flat, Stroke-BG and Stroke-Color. Everything to fit your needs! Enjoy! "We were on the look out for a set of clothing icons for one of our projects; but we never really found the ones we liked. So we hit upon the idea of making a set of clothing icons, which would have every item of clothing we could think of. 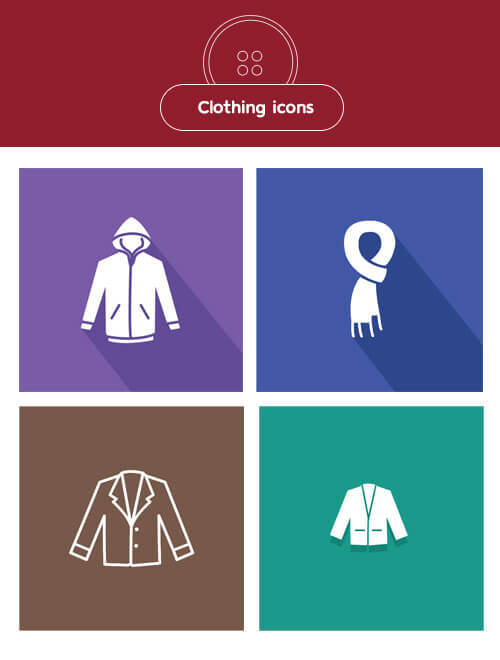 This set of icons consists of all the icons related to fashion and clothing; be it a shirt, a frock, even a hat and a scarf. We made sure each and every icon is pixel perfect and precise which will make it easier for everyone to use it to their preferences. After making the whole set, we felt the need to share this pack with everyone out there searching for good looking clothing icons for their projects. We hope they find it useful in any of their projects and share the collection with others too. Cheers!" A big thank you to Creativebin — we sincerely appreciate your time and efforts. Keep up the brilliant work!